Brice started practicing yoga in London, England, in 2001 at the age of 18 and became a daily Ashtanga practitioner under Atlanta-based teacher Gary Jones in 2010. Gary was instrumental in teaching Brice full primary and encouraging her to go deeper in her yoga study. From there, Brice became a student of David Garrigues in 2013 (one of 47 certified by the late Pattabhi Jois) of Philadelphia, PA. With David, Brice began to deepen her philosophy study, Sanskrit study, and practice of pranayama and chanting. In 2015 Brice became a student of Sharath Jois (lineage holder of Ashtanga yoga, grandson of the late Pattabhi Jois) and KPJAYI in Mysore, India. Brice continues to take annual trips to India to study under her teacher, Sharath, and while in India continues to study Sanskrit, chanting, and philosophy under Lakshimsha at KPJAYI. Brice has been teaching in Atlanta since 2011. She has had the opportunity to start an Ashtanga program in Norcross and Marietta, GA. She's previously held the Director of Yoga postion for Wellness Centers of America, and spent time teaching yoga to active military members home from deployment. Brice has also taught yoga to athletes of all levels via Accelerated Athlete and Karen Brown of Atlanta, GA. Brice is grateful to be at Ashtanga Yoga Atlanta, and grateful to Todd Roderick for not only giving her the opportunity to share what she's been blessed to learn, but for being the original teacher and student of the late Pattabhi Jois to bring the practice of Ashtanga to the South East. 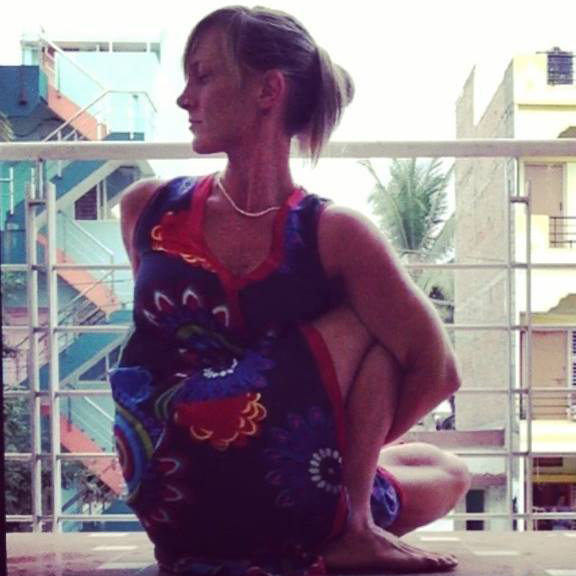 Brice's intention in her teaching is to bring the power of the philosophy into the asana practice, a philosophy that has changed her life and is the foundation of the practice. Brice fully believes in the power of the count in asana to bring focus of mind. She hopes to uphold integrity as well as strong discipline in the Mysore room just as her teachers do for her. Brice is also the founder of The Mysore Foundation, a collective group of KPJAYI students who strive to give back to the people of Mysore, India, and support other organizations in India in their quest to assist those affected by poverty. The Mysore Foundation also serve those in the Atlanta area. What is the Mysore foundation, list the purpose and what you want to elaborate on specifically here.